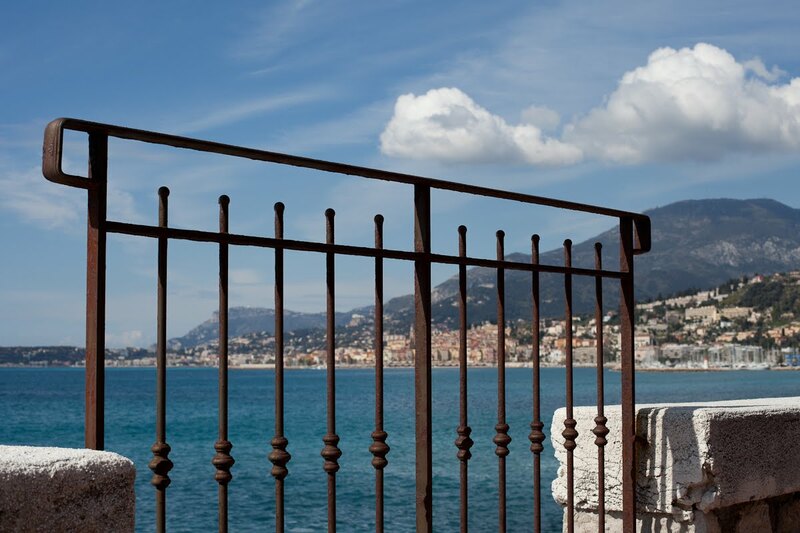 We're at the frontier between France and Italy looking back at Menton and Monaco in the distance. The sloping roof you see to the right of the smaller photo, is the French customs office. Some people want to keep it as a listed building, others think it's really ugly! The actual line than divides France and Italy is slightly nearer to the camera and out of shot. Nous sommes à la frontière entre la France et l'Italie, regardant Menton et Monaco dans le lointain. Le toit en pente que vous voyez à la droite de la petite photo , c'est le bureau de douane français. Certaines personnes veulent le garder comme un bâtiment classé, d'autres pensent que c'est vraiment laid! La ligne réelle qui divise la France et l'Italie est légèrement plus proche de la caméra et hors champ. I don't think it looks too bad Jilly, it's not like it sticks out like a sore thumb! It blends quite well oui! It is a good thing that travel across borders is so effortless. Many Americans have little experience driving across a border. I remember walking through that customs office years ago as a student. I think that was the first time I crossed a border on foot. I hope they save it. It is featured in the movie "Day of the Jackal". We were stopped there once by soldiers with guns when there was a problem with Algerian terrorists in the 1990"s. They just waved us through though. 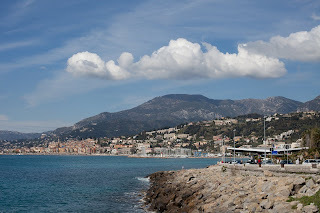 My husband walked to Italy and back almost everyday when we lived on the Rue Longue, but he did not go as far as the outpost. He lost 80 lbs.! There is one customs office on the french-german border which is now a florist shop. Everything is possible, I guess. It looks fine to me. I've driven across the Mexican border south of San Diego--ugh. I also drove over near Mexicali. Not so ugh. But that was more than 20 years ago.